Camp Bethel in Fincastle, Virginia is owned and operated by the Virlina District Church of the Brethren (Federal Tax ID# 54-6043879) with offices in Roanoke, Virginia, and we are a 501(c)3 non-profit organization. Gifts are tax-deductible in the year given. Thank You for your gift! Your information is kept confidential. All gifts are fully tax-deductible for the year in which they are received, and we will send you an annual tax/gift letter. OUR SPRING 2019 WISH LIST: Road-worthy mini-van; clothes dryer; chest coolers w/ handles; old smart phones (to use as cameras and video cameras); digital cameras; GoPro video camera; portable LCD projector; gas grill; laptop computer (Windows 10); LED light bulbs (75-100 watt equiv); new (in-the-box) bike helmets and horse helmets; brooms w/ dustpans; “Tree Cookies;” picnic tables. Gifts are tax-deductible! PLEASE DONATE TO BUILD OUR 2019 "CAMPERSHIP" FUND: In summer 2018, 75 campers received "Campership" funding totaling $20,430. Our December 6 Christmas Together Banquet raised $5,940 for 2018 Camperships, and now we need to rebuild our 2019 funds. $350 is the 2019 cost for one week of camp. Memo checks "Camperships" or donate below. STEP 1. 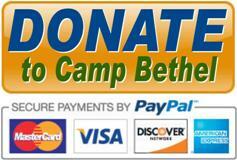 Clicking the "DONATE" button after Step 4 below takes you to Camp Bethel's secure PayPal "Donate to Camp Bethel" site. Enter your gift amount, and choose PayPal or credit/debit card. ​STEP 2: Click the "Tell us..." pencil icon and write your gift details so we can match YOU to your gift. STEP 3: Click the "Share your mailing address..." so that we can match you to your donation AND so we can mail you a contribution letter. Also please share your email address with us. Thank you! STEP 4. 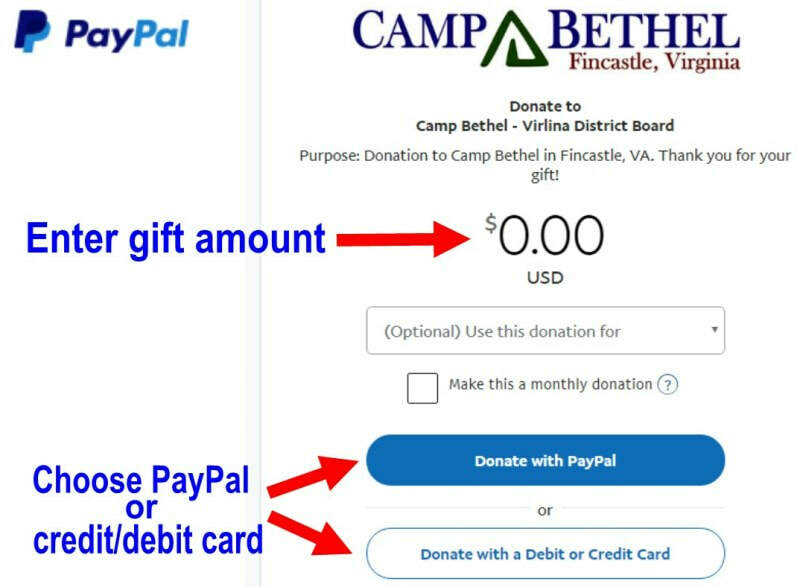 You will receive a confirmation e-mail from PayPal showing your successful donation to Camp Bethel, AND we will send you a Thank You letter including tax information. READY? Click the "DONATE to Camp Bethel" button below. Thank you! Camp Bethel in Fincastle, Virginia is owned and operated by the Virlina District Church of the Brethren (Federal Tax ID# 54-6043879) with offices in Roanoke, Virginia, and we are a 501(c)3 non-profit organization. Gifts are tax-deductible in the year given. Thank You for your gift!